Garson, G. D. (2012). Log-Linear Analysis. Asheboro, NC: Statistical Associates Publishers. Instant availablity without passwords in Kindle format on Amazon: Not yet available. .
ASIN number (e-book counterpart to ISBN): B00B0P10I0 . Also called multiway frequency analysis (MFA), log-linear analysis is a special case of the general linear model (GLM, which includes regression and ANOVA models) created to better treat the case of dichotomous and categorical variables. It is a method of analyzing the distribution of cases in a table when all the variables of interest are categorical. Usually there is no "dependent variable" as in regression, though the special case of logit log-linear analysis, discussed below, can handle dependent variables. Ordinarily, however, what is predicted is not a variable but instead is the distribution of values in the table formed by categorical variables. The table is not limited to the usual two-way table but may be of any order (any number of categorical variables). Thus log-linear analysis deals with association of categorical or grouped variables, looking at all levels of possible main and interaction effects, comparing this saturated model with reduced models. The primary purpose is to find the most parsimonious model which can account for cell frequencies in the table being analyzed. While log-linear analysis is a non-dependent procedure for accounting for the distribution of cases in a crosstabulation of categorical variables, it is closely related to such dependent procedures as logit and logistic, probit, and tobit regression. 1. The expected distribution of the categorical variables is Poisson, not binomial or multinomial. 2. The link function is the natural log of the dependent variable, not the logit of the dependent as in logistic regression. (A logit is the natural log of the odds, which is the probability the dependent equals a given value [usually 1, indicating an event has occurred or a trait is present] divided by the probability it does not). 3. Predictions are estimates of the cell counts in a contingency table, not the logit of y. That is, the cell count is the dependent variable in log-linear analysis. Log-linear methods also differ from multiple regression by substituting maximum likelihood estimation of a link function of the dependent for regression's use of least squares estimation of the raw dependent variable itself. The link function transforms the dependent variable and it is this transform, not the raw variable, which is linearly related to the predictor side of the model. There are several possible purposes for undertaking log-linear modeling, the primary being to determine the most parsimonious model which is not significantly different from the saturated model, which is a model that fully but trivially accounts for the cell frequencies of a table. Log-linear analysis also is used to determine if variables are related, to predict the expected frequencies (table cell values) of a dependent variable, the understand the relative importance of different independent variables in predicting a dependent, and to confirm models using a goodness of fit test (the likelihood ratio). Residual analysis can also determine where the model is working best and worst. Often researchers will use hierarchical log-linear analysis (in SPSS, the Model Selection option under Log-linear) for exploratory modeling, then use general log-linear analysis for confirmatory modeling. Generalized linear modeling. 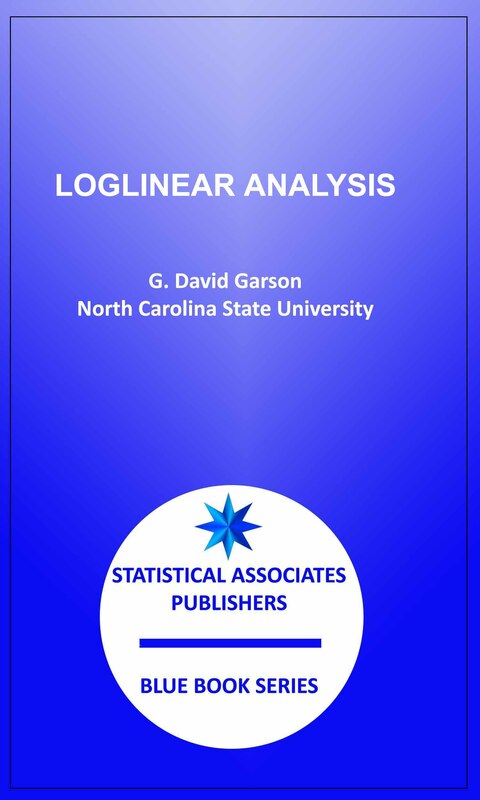 Generalized linear modeling (GZLM), discussed in a separate Statistical Associates "Blue Book" volume, represents a more recent approach for analyzing categorical dependents and independents, thus constituting a different method for implementing log-linear analysis, as well as models for logit, probit, Poisson regression on cell count data, and others. Hierarchical log-linear analysis (HILOG). Select Analyze, Log-linear, Model Selection. HILOG is often used for automatic selection of the best hierarchical model. General log-linear analysis (GENLOG). Select Analyze, Log-linear, General. GENLOG is often used to refine the best hierarchical model to be more parsimonious by dropping terms. Logit loglinear analysis and logit regression. Used when there are one or more dependent variables. In summary, traditional approaches to categorical data relied on chi-square and other measures of significance to establish if a relationship existed in a table, then employed any of a wide variety of measures of association to come up with a number, usually between 0 and 1, indicating how strong the relationship was. Log-linear methods are similar in function but have the advantage of making it far easier to analyze multi-way tables (more than two categorical variables) and to understand just which values of which variables and which interaction effects are contributing the most to the relationship. For simple two-variable tables, traditional approaches may still be preferred but for multivariate analysis of three or more categorical variables, log-linear analysis is preferred.